Facebook Spy Monitor - Facebook profile monitoring software. Facebook Spy Monitor - Facebook Spy Monitor is a Facebook profile monitoring and parental control software. It secretly records PC users\' Facebook private profile, emails, chats & IMs, photos, interests, contatcts and events by taking screen snapshots periodically. Facebook Spy Monitor is a Facebook profile monitoring and parental control software. It secretly records PC users\' Facebook private profile, emails, chats & IMs, photos, interests, contatcts and events by taking screen snapshots periodically. Facebook Spy Monitor also records users\' online searches about Facebook, popular Facebook instant messenging clients, and Facebook related web sites. You can see exactly what the users were doing just like watching a surveillance video playback. You can view the screenshots directly from the embedded image / slideshow viewer. It is especially useful for parents, who need to know what their kids are care and talking about with others. The software is invisible to computer users. However, it is very easy for you, the administrator to use your hotkey to unhide it from complete Stealth Mode. The hotkey is ONLY available in your only Windows user account so that other users won\'t be able to guess it by enumerating key combinations. And the program access can also be protected by password. 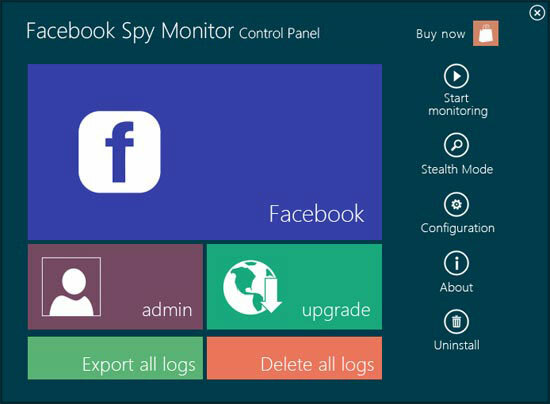 SpyPal Facebook Spy is a Facebook activity monitoring and parental control software. It secretly records PC users\' Facebook private profile, emails, chats & IMs, photos, interests, contatcts and events by taking screen snapshots periodically. It also records popular Facebook instant messenging clients and Facebook related web sites and searches. See exactly what users were doing just like watching a surveillance video playback. Facebook Activity Spy secrectly logs all Facebook use, keystrokes, web visits, emails, chats & IMs: Windows Live Messenger, Yahoo Messenger, Skype and other IMs. It logs applications, documents, clipboard, user names, passwords, video talk, video played and more. It also takes screenshots at every X seconds like a surveillance camera. It runs invisibly so that monitored users won\'t know it. You can receive log reports remotely via emails or ftp. MxSpy is the best spying app for mobile that works well on Android, iOS, Symbian, and BlackBerry. The software endorses their products as a monitoring app that can help you spy on your kids or employees mobile phone. This app can be installed easily on your mobile phones. Once you install, the program records all activities that happen on your target\'s mobile phone. You must register at my.mxspy.com to get your own account.